Could Sherlock Holmes have prevented World War I? Was there something he might have done … could have done that was the ‘sine qua non’ without which the war might never have started. This new mongraph in the Great Game of Sherlockian scholarship argues that there was such a Sherlock Holmes factor … and that it is secretly revealed in the ‘roman a clef’ story that we know as ‘The Adventure of the Beryl Coronet’. One hundred years ago, the world was engulfed in the greatest, most horrible series of battles ever known – World War One. If you are interested in that period of history AND a devotee of Sherlockian scholarship, you will enjoy this enlightening monograph. Get it NOW and follow the irrefutable logic. 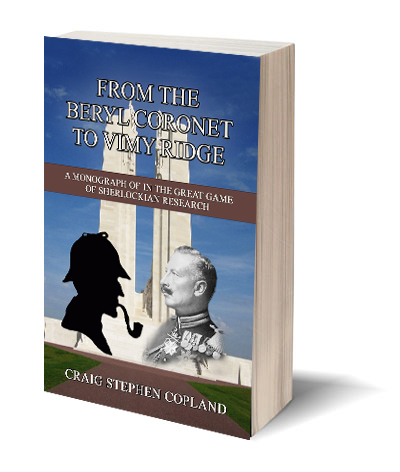 For any other country just type “Sherlock Holmes Copland” into the Amazon search bar to look inside and order your copy in paperback or e-book. The characters of the Sherlock Holmes stories and the first fifty Sherlock Holmes stories published are in the public domain. New Sherlock Holmes Mysteries written by Craig Stephen Copland are protected by copyright.